Yesterday, I spent the day at Flyers Development Camp, where Flyers prospects and invitees worked on drills to hone their skills with the Flyers’ development team, including Derian Hatcher, Ian Laperriere and Riley Cote. Obviously at these camps, you won’t learn a whole lot about a player, especially doing repetitive drills. Many of the drills were set up to see what the players could do, with the Flyers brass (including Paul Holmgren) watching. The day was split into two sessions, defensemen early and forwards later. 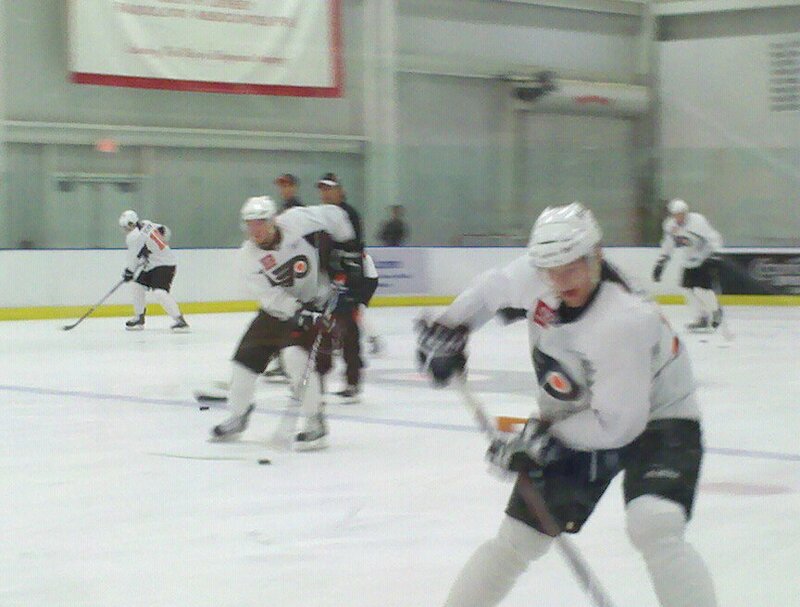 Most of the fans’ eyes were on both Brayden Schenn and Sean Couturier. Schenn seemed to struggle in some of the early drills, but the team will probably take a deeper look at the young center during Flyers’ training camp in September. Couturier showed some nice hands throughout the session. His goal this year is to make the NHL, but between the Flyers’ lack of roster space and no need to rush him, he will likely find himself back with Drummondville of the QMJHL. Zac Rinaldo is a curious case. Not drafted by the Flyers for his scoring prowess, Rinaldo’s three years in the OHL got him 27 goals, 69 points and 669 PIM. If you include postseason, he has yet to have a season under 200 PIM. He had 331 PIM with the Phantoms in the AHL last year, and collected more suspensions (4) than goals (3). So why is he even worth watching? Well, it’s just development camp, but he looked impressive yesterday. While some of his counterparts coasted through the drills, Rinaldo seemed to give his all throughout the morning. If he can tone down his antics, maybe he can develop into solid role player. That’s a big if though at this point. The three of us continue our mock draft from Part I (1-15). His speed and forechecking will be 2 valuable assets to the Buffalo Sabres system. Another plus is his ability to switch from center to wing, making him fit on any line with little to no effort. Centering the top line at St John’s and improving his linemates scoring outputs in addition to his own makes him a great option if still available at #17. What hands he has, a real whiz with the puck. A Youtube star already. Will be a great addition to Edmonton’s defense, he adds decent size (6’4″, 200lbs), and a nice shot to the blueline. An intriguing prospect that can appear quite high for many teams from the 10 pick onward. His combination of size and skill would complement Phoenix well. Already 6’3, 205 at age 17, he covers up a lot of net. Lead USA to gold at the U18s. The Ducks will love Saad’s ability on the ice, speed is his greatest asset. Has a nice balance of offensive/defensive ability. A strong skater with good scoring ability at the RW will fit well for the Pens in due time under a Dan Byslma system. Add in his size and you also may have a future net front presence. Brodin is a good skating, two-way defenseman. Plays a smart game in his end, and will fit right in with Detroit. The Leafs are going to love this guy, a shot blocker, board battler, and he’s not too bad at scoring either. And more all around good players, is exactly what Toronto needs in their system. His size and skill down the middle would fit the Capitals to a T. As they recently have had an abundance of big players who still have skill and speed. The 6’7, 245 monster may need some more time to develop, but could eventually be Tampa’s Twin Towers with Hedman. Extremely sturdy on his feet, smart, great puck carrier, but never afraid to fight or deliver a big hit when it’s needed. Could be huge for the Sharks in the future. While the Canucks can use a pure scorer in their talent pool. This late in the first round they may have to accept a project of a good two-way player who didn’t quite put it all together this past season. A worthwhile risk. A big, physical forward that likes to use his size and isn’t afraid to work hard. Definitely a Brian Burke player.